Since it has been a while since we’ve gathered this data from FracFocusData, a quick calculation shows Extraction Oil & Gas has used 102,044,434 gallons of water to frack the 10 wells at the Coyote Trails pad just east of Erie, Colorado in unincorporated Weld County. Extraction Oil & Gas has used one hundred two million, forty-four thousand, four hundred and thirty four gallons of water to frack the ten wells at Coyote Trails. Keep in mind that these 10 wells are just the beginning; 4 Form 2s have already been approved and another 24 are pending for this location. Results coming in from air quality tests near Parachute, CO shows “little risk”…”According to the data, all air concentrations of individual and combined volatile organic compounds (VOCs) were below long-term, non-cancer health guideline values established by state and federal agencies.” But I’m sure you and ECBU will find some flaws with the tests to discount the results… Still, it is good to have more data points. Air monitoring begins at Battlement gas pads is the original news story from the Post Independent. Conditional Air Sampler Quarter 3 Data Report is the report prepared for Garfield County by Air Resource Specialists. OGHIR Conditional Sampler Health Risk Assessment 3rd Quarter is the report prepared for Garfield County Public Health by the CDPHE. Quarter 3 BOCC presentation – Battlement Mesa Conditional Samplers is the presentation made by Morgan Hill, an Environmental Health Specialist III for Garfield County. Reversal of global atmospheric ethane and propane trends largely due to US oil and natural gas production, co-authored by Detlev Helmig. Read on for some comments. This article is reprinted from the Winter 2018 issue of Elife. In a recent tweet for the Erie Protectors (follow us @ErieProtectors), I mentioned that there are 13,103 producing wells in Weld County alone. Another 8,386 are shut in. Another 4,377 have been plugged & abandoned. Another 1,143 are currently being drilled. Well statistics from the COGCC Daily Activity Dashboard, taken on January 16, 2018. The numbers are staggering, especially when we get weekly reminders in the news of explosions, fires, spills, and releases of volatile organic compounds (VOCs) at these facilities during their various stages of production. A well is abandoned when it reaches the end of its useful life or is a dry hole. The casing and other equipment is removed and salvaged. Cement plugs are placed in the borehole to prevent migration of fluids between the different formations. By the industry’s own admission, “end-of-well operations are often more difficult than initial well construction.” Let this be a cautionary tale told in three parts. The Vessels Minerals site is 25 yards from the Aspen Ridge Preparatory School playground. While Crestone took corrective action the same day and installed emission control equipment, they had every intention of venting VOCs 25 yards from a playground for 8 weeks while they conducted business as usual. The community was only made aware of the NOAV when an Erie Protector found it online almost two months later. Lessons learned? If you see it, report it. The rules & regulations are inadequate to protect us. The industry has complete disregard for the communities in which they operate. Our second tale comes from an idyllic suburban development just east of Grandview in Erie. The concept plan for Erie Highlands includes three innocuous “oil & gas site” designations in what appear to be pocket parks and open space. Imagine the surprise of recent owners of near-million dollar properties when fourteen characters on a pretty picture turned into a work over rig less than 100 yards from their back doors, especially when realtors had told them the wells were already plugged. The workover rig at the William H. Peltier #2 site, originally completed in 1986. Lessons learned? Do your homework. Self-serving realtors and developers have no interest in providing more than the minimal state-mandated disclosures about nearby oil & gas developments. They will pretend property values are unaffected and will deny community meetings to inform residents of O&G operations. When you’re looking for a new home, visit the COGCC online map at http://cogccmap.state.co.us/cogcc_gis_online/ and find out where historical, current, and future O&G development may impact you. Saulcy 4-1 and surfacing liquid near well location. Our final tale comes from Windsor, where in October 2017 “an old well that was capped in 1984 began spilling oil on Colorado 60 east of U.S. 287.” Operators in the region were quick to respond to the well that had been drilled by an unknown operator in the 1920s or 1930s, but “an estimated 5 gallons to 6 gallons every minute” were spilling from the well. Lessons learned? Oil & gas is forever. This blight upon our neighborhoods, open spaces, and environment has far-reaching implications. Operators come and go, but their impacts will remain long after we forget their names. For you data heads out there, check out http://www.noggateway.org/explore to see visualizations and export data for oil & gas wells across the county. This web app has the nicest set of tools for extracting data to other sources that I’ve seen thus far. For example, the attached image shows how Crestone Peak Resources’ production in Colorado has been on the decline since late 2015. In Part I, we showed how Crestone Peak Resources had used 160,349,639 gallons of water to frack the 13 wells at the Waste Connections and Pratt sites. Sadly, it gets worse. Between the Morgan Hills, Woolley-Becky, and Woolley-Sosa sites, Crestone Peak Resources used 225,137,194 gallons of water to frack 22 wells. 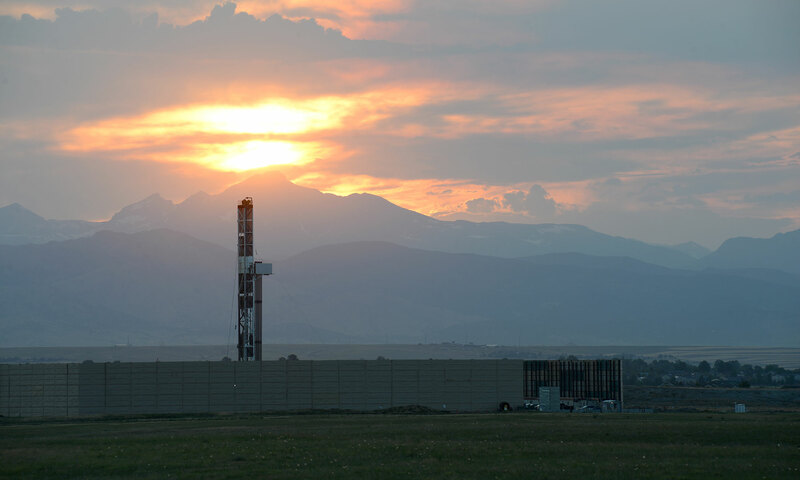 Crestone Peak Resources has used three hundred eighty-five million, four hundred eighty-six thousand, eight hundred thirty-three gallons of water to drill 35 wells on five pads in Erie, Colorado. Recently, we stumbled upon FracFocus, an additional resource linked from the COGCC complaint site. FracFocus allows the public to view “Hydraulic Fracturing Fluid Product Component Information Disclosure” documents that include some summary information for each well, as well as a detailed chemical composition of the fluids injected at each well head. We ran the numbers for Waste Connections and Pratt, and came up with a single catastrophic statistic: 160,349,639 gallons of water.